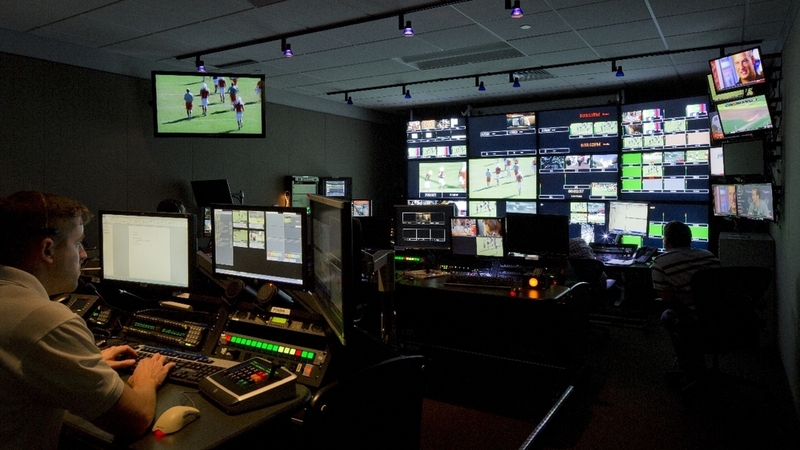 When ESPN and the University of Texas agreed to launch the Longhorn Network, they needed a quick turnaround to be prepared for the 2011 football season. The design team was engaged in May and the station was on the air on September 1. Flexible design and close communication accommodated the Owner’s evolving vision for the station. Design and execution strategies included: bringing a construction manager on board at the outset, involving the landlord during design phase to avoid late roadblocks, designing and building technical spaces (studio, control room, equipment room) first to allow early occupancy by the broadcast integration team technical staff, and using temporary modular furniture for the administrative, and news gathering staff offices, while the construction of the technical spaces was permanent. The Longhorn Network occupies approximately 25,000 sq. ft. of space on the 5th floor of a commercial office building. Longhorn’s leased space included 1st Floor level storage and UPS room. After initial occupancy, DesignTech was further engaged to provide permanent design for the news gathering/production and administration areas as well as for a central UPS system to support the technical operations and a dedicated chiller to minimize overtime HVAC charges.